It’s Spring, which means it’s time to think about how you want your yard to look for those BBQs this summer. If you’re thinking about doing something new, you may want to consider xeriscaping. Xeriscaping is a landscaping and gardening method that reduces or eliminates the need for watering. It’s often promoted in areas with limited water supply, or that are experiencing drought conditions, but it’s good for anyone who wants to conserve water, and produce less waste, while still having a nice looking yard. Xeriscaping is also easier and less expensive to maintain than a traditional grassy lawn. 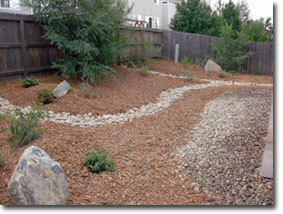 Xeriscaping employs a combination of plants, grasses, mulches, and rocks that require little to no water. Using a professional to help design and implement the xeriscape will ensure that it will be done in a way that is efficient and aesthetically pleasing. At Colorado Stoneworks Landscaping, xeriscaping is one of our specialties! Check out our Portfolio and watch the video below for some examples of our work. Contact us for more info or to get a free quote on your next xeriscape project. ← Previous Previous post: Crews Are Back at Work! Hello, I was wanting to find out more about Xeriscaping as our yard is a disaster and I really don’t want to worry about maintaining a traditional grass lawn. Are you available to do a free estimate of services?